We love to make pizza at home – sometimes we get fancy and make our own crusts, sometimes we take the super easy route and make pizzas on bagels and, once in a while, I have some frozen gluten-free pizza dough on hand. The only problem with frozen dough is that I need to know what I am making for dinner 24 hours ahead of time… I can assure you that rarely, rarely happens here. However, pizza dough isn’t just for pizza. 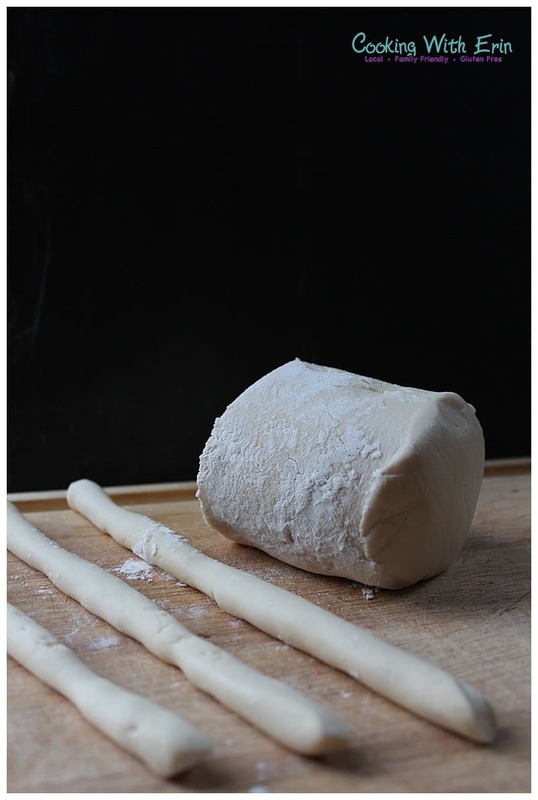 A very kid-friendly use of frozen pizza dough is making pretzels. After you see this “recipe,” you are going to stock your freezer with pizza dough balls. If you have ever been to any mall in America, you have probably been lured by the smell of Auntie Anne’s pretzels … confess. If you are gluten-free, this is a sad, sad smell. My girls and I gaze longingly at those shiny brown specimens, glistening with butter and generous flecks of coarse salt. A similar pretzel is within your grasp – in under 30 minutes – I promise. This recipe has a few key steps and each one is pretty easy. First, you need to thaw your frozen pizza dough overnight and then let it sit out on the counter for a bit. After it is soft and easy to work with, you will cut it into sections to roll out into thin strips. This is a key kid task. We put a little bit of gluten-free flour on the pizza dough to prevent it from sticking and then let the kids roll out the sections evenly on a big cutting board or just on the counter. 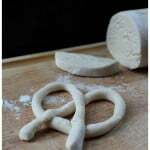 Then let them shape their sections into something that resembles a pretzel. Auntie Ann’s isn’t doing any quality control, so our standards for appropriate pretzel shapes are pretty low… I will suggest that the smaller, chubbier pretzels came out a little bit chewier and tastier after they were baked. After shaping the pretzels, we placed them on a parchment lined cookie sheet before we moved on to big step #2 – parboiling. The second step before baking the pretzels is to drop them in boiling water that has a couple of tablespoons of baking powder in it. This step is really quick and I even used a small, 2 1/2 quart pan to boil the water because I just dropped a couple of pretzels in at a time. Let the pretzels sit in the boiling water for about 45 seconds to a minute. If they don’t float to the top, give them a little nudge with your strainer. After you remove them from the water, let the excess water drip back into the pan for a few seconds and then put them right back onto the parchment paper. Before baking them in a 400 degree oven, brush the warm, parboiled pretzels with butter and sprinkle with some coarse sea salt. This is another awesome step for little fingers. Literally, my kids rubbed the butter over the pretzels. Gluten Free Pizza Dough Pretzels – Ready To Eat! The final step is baking the pretzels. We bake ours for about 20 minutes at 400 degrees. If your pretzels are smaller, you might need less time. Keep an eye on them after about 16 or 17 minutes. These were such a tasty treat and absolutely perfect for back to school afternoon snacking. Enjoy! Thaw frozen pizza dough overnight and then let sit on the counter for about 20 to 30 minutes. Cut pizza dough into sections. Roll on an even surface into a 14 to 16 inch tube-shaped strip. 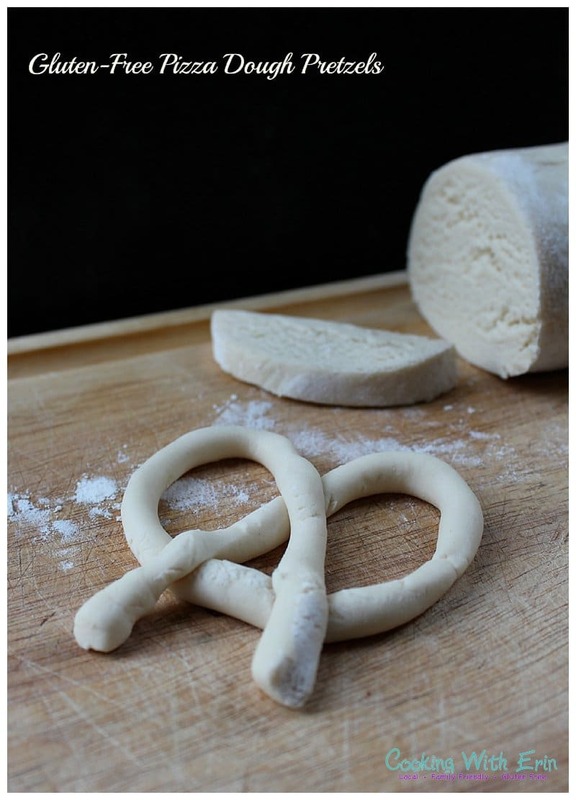 Shape the rolled sections into pretzel shapes and place on parchment paper lined cookie sheet. Bring a pot of water to boil. For every two quarts of water, use 2 tablespoons baking powder. Drop two to three pretzels carefully into the boiling water and let sit for about 45 seconds to 1 minute. If the pretzel doesn't float to the top, give it a little push with your strainer spoon. Drain the pretzels one at a time over the pot to let any excess water drip off, then place carefully back onto parchment paper. Using your fingers or a pastry brush, brush butter generously over the pretzels and sprinkle with coarse salt. Bake for about 18 to 20 minutes until the pretzels are golden brown. 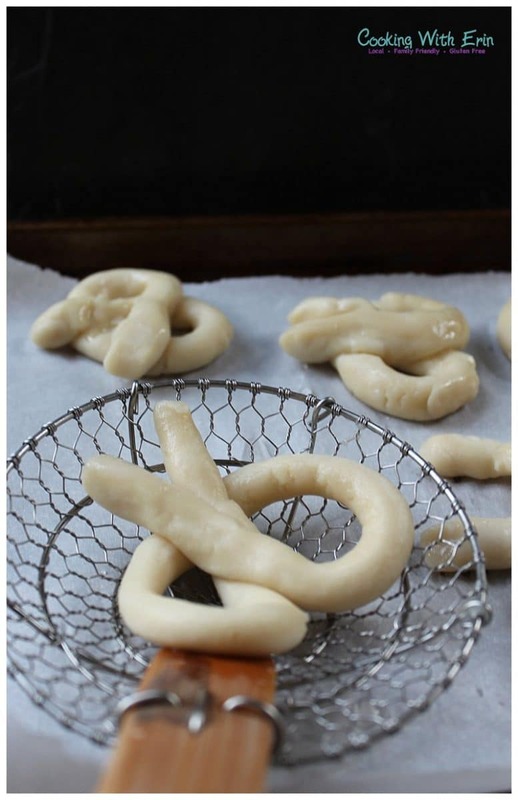 For dessert pretzels, after brushing with butter, sprinkle with cinnamon and sugar! This is awesome! My mother-in-law is gluten-free and she only treats herself to pizza once in a while. She never buys fresh dough because it is only herself, but making these pretzels would be a great way to have some snacks hanging around. I sometimes get a little teary when I discover a treat I thought I could never have again!! I understand! Love being able to take a shortcut with the pizza dough. 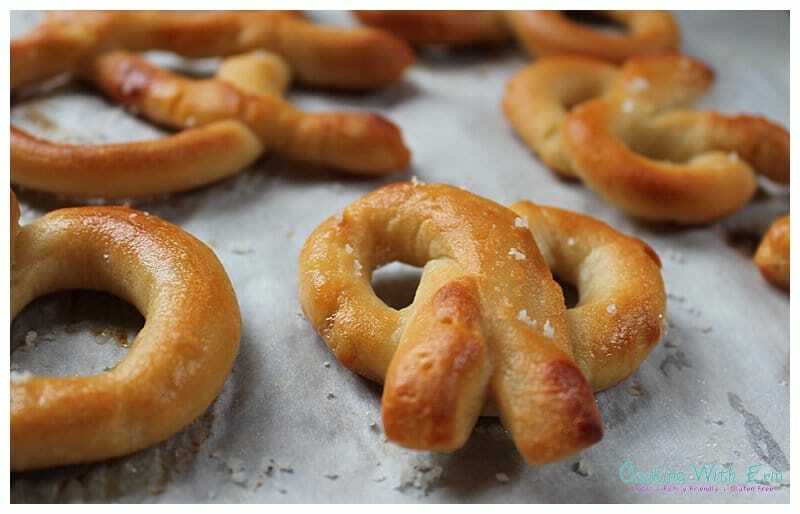 I’ve never made my own pretzels and I think even I can do this, YUM! LOVE finding easy shortcuts for fun snacks! Thanks, Debra! Oh my goodness! LOVE these cute little pretzels. I also love that they are gluten free. YES!! They are so cute, aren’t they? Thanks! I was as giddy as the kids were that we could actually make them GF! which brand of gluten free pizza dough is it. Hi Subiha! I used the store bought frozen pizza dough I found at my local Earth Fare.